The pursuit for independence starts with the decisions made about equipment. 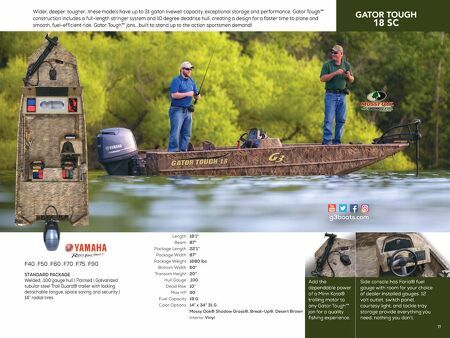 Nothing but the best will match up to the challenges that are commonplace for the serious sportsman; nothing but Gator Tough™ Jons by G3 are proven, adventure after adventure, to be the experienced outdoorsman's choice. STANDARD PACKAGE Welded, .100 gauge hull | Painted | Galvanized tubular steel Trail Guard® trailer with locking detachable tongue, space saving and security | 14" radial tires Optional leaning post sports a camo pattern cushion for comfort while standing and driving. F50 . F60 . F70 . F75 . F90 18'1" 87" 22'1" 87" 1705 lbs 60" 20" .100 10° 90 19 G 11" x 21" 16 G + 14" x 34" 31 G Mossy Oak® Shadow Grass®, Break-Up®, Desert Brown Interior Vinyl Length Beam Package Length Package Width Package Weight Bottom Width Transom Height Hull Gauge Dead Rise Max HP Fuel Capacity Livewell Dim. & Cap. Color Options 76 Center console with Mossy Oak® camo accommodates every angler with added freedom of movement. 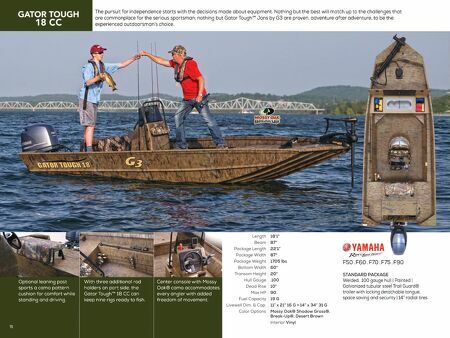 With three additional rod holders on port side, the Gator Tough™ 18 CC can keep nine rigs ready to fish.